Yes this post has a funny title. That is because those were the words in an email Mildred of Horrorible Reviews sent me one day along with a link. I loved her sentence so much I almost didn’t want to read the link because I doubted it would be as good as her line. I was wrong. It was just as good. Mildred sent me a linked article from the Website A Dribble of Ink a blog by Aidan Moher about fantasy and science fiction. The article was titled: ‘We Have Always Fought’: Challenging the ‘Women, Cattle and Slaves’ Narrative by Kameron Hurley on May 20th, 2013. It is an excellent and well written article about women and women warriors. Oh and don’t worry, the llamas do get explained. Enjoy the article here at the original link. All in all, it is good. 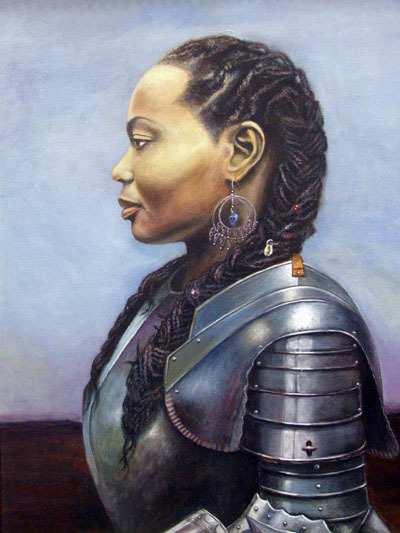 The Huntress, art by S. Ross Browne (http://www.srossbrowne.com/srossbrowne/begin.html). This fabulous picture is from the article and I just HAD to repost it. I love it. I want my own copy. Hello! I’m glad you enjoyed Kameron’s essay so much that you want to encourage other readers to discover her message about scaly llamas. However, Kameron and I would appreciate it if you could remove the body of the essay from your post here. The content of the essay belongs to Kameron and can only be reprinted with her permission. The images in the essay above are also linked directly to my webserver, costing me bandwidth unnecessarily. Please forgive me. ARGH! I can’t believe I forgot about costing someone else bandwidth! I have taken down the content and of course kept the link to you and the wonderful article by Kameron! Thanks so much for posting a wonderful article.